E-bikes have been around ever since the early 2000s, but their popularity has exploded among cyclists of all skill levels in recent years. Electric bike conversion kits are more popular than ever and choosing one that suits your needs the best can be difficult if you aren’t familiar with the technical side of what they offer. 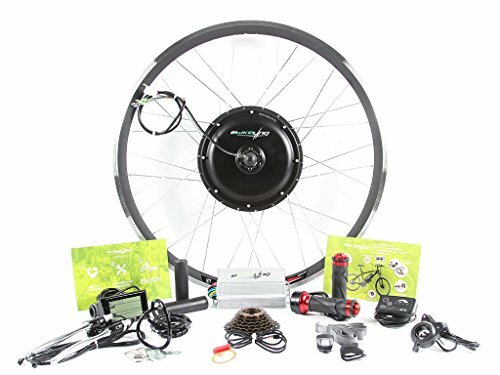 Not all kits will give you the same parts and features, especially if they’re meant for specific types of bike, so it’s a good idea to research your options and buy an electric bike kit that fits your needs. 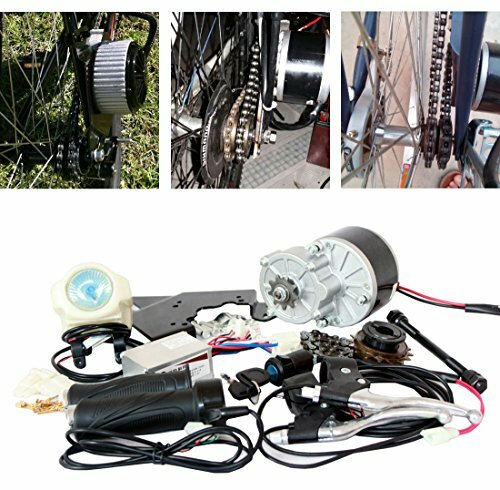 Below is our electric bike kit Buyers Guide of five high-quality conversion kits for creating an e-bike, as well as some of our reasons for recommending them and the types of cyclist that might need them most. This AW conversion kit offers a full LCD display that monitors the speed, mileage, gear settings and battery power of your bike, letting you keep track of everything by simply glancing down at the handlebars. The automatic Pedal Assistance System allows you to keep pedaling without losing the motor’s functionality, making it great for cyclists who don’t want to switch to a motor permanently. 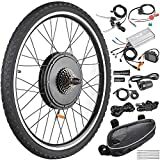 This, along with the dual mode motor and reinforced wheel, means that this kit can be an excellent choice if you’re completely sure about converting your bike. Why We Liked It – This kit contains a lot of different pieces, meaning that you could easily fit it onto a bike of any shape and size with enough effort. This wheel-less conversion kit is meant to overhaul a bike’s spokes and chain, making it motorized without changing too much of the chassis or frame. The freewheel motor means that you won’t drain power while you’re pedaling normally, letting you switch back and forth on the fly, and the simple parts mean that it’s easy to use in custom conversions or projects. The twist or thumb-based throttles allow you to keep the keys and battery life display within arm’s reach of you at all times, regardless of which type you choose. Why We Liked It – This kit is incredibly simple, using plenty of distinct parts that are hard to accidentally swap around while you’re converting your bike. This EBikeling kit is really easy to install right out of the box, allowing you to transfer an existing tire straight onto the motor setup. The kit comes in four variants, using LED or LCD display setups for either the front or rear wheel, with each one using a Pedal Assist Sensor and optional freewheeling to allow near-instant switching between regular pedaling, powered-assisted pedaling and fully-motorized movement. The built-in display can record your traveled distance and current speed on longer trips, as well as the battery level and the total wattage your motor is using. Why We Liked It – This conversion kit is easy to install and allows you to use your own parts if needed, giving you a lot more control over how your new e-bike is constructed. 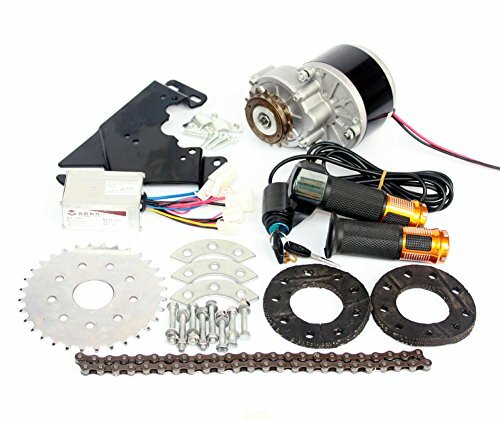 This brush motor kit only fits certain bike models and sizes, but it can output a lot of power without removing your ability to freewheel. The strong mounting plates mean that it won’t fall apart easily, and the design of the system means that everything connects to a single control box, keeping all the important cables safe against the frame. 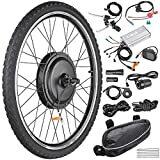 This electric bike kit also comes with a headlight, safety switch, engine key, and a freewheel adapter, giving you plenty of equipment without adding much bulk to your bike or weighing you down. Why We Liked It – This specialized kit, when applied to the right bike, can make turning it into a very efficient e-bike with very little effort. 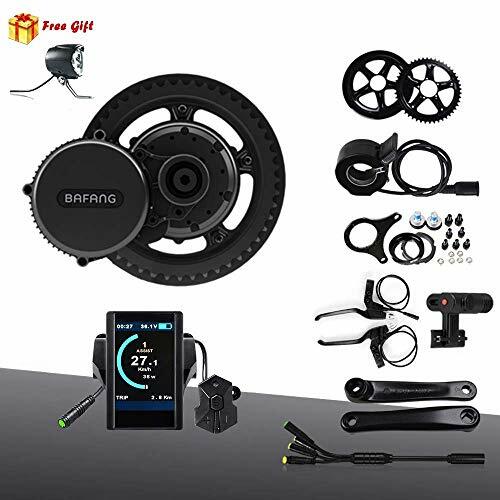 This kit comes with a host of DIY pieces and accessories for any kind of bike, but its main feature is the Bafang Intelligent Speed Sensor System, which uses a speed sensor to control your motor’s output based on the current situation. The cables are all waterproof to prevent rain damage and small shocks, and a built-in LCD display keeps you up to date on how your bike is performing. When it comes to installing the parts, the process is also extremely easy, and every part is clearly distinct from the others. Why We Liked It – BAFANG’s electric bike kit is simple but offers some excellent technology that cyclists of any kind and skill level will find useful, even if they prefer to pedal manually. Not every kit will work with every bike, and an incompatible kit will be more or less worthless to you unless you can afford a new bike to go with it. It’s key that you make sure you’re buying something that you can use: not only will certain bike chassis and models not work with certain electric bike kits, but they might also need specific wheel sizes or frame parts to fit properly. You should also think about the kits themselves – will they work properly with other modifications or custom parts on your bike? A lot of professionals and hobbyists will have changed at least one part of their bike in a way that doesn’t match the factory models, and a permanent modification or upgrade could stop you from using an otherwise-compatible e-bike kit. Certain electric bike kits will be accessible to new cyclists, or those who use their bikes for travel rather than recreation, but others might expect you to be familiar with e-biking and high-level cycling techniques right off the bat. You might also need to know certain skills to actually install them or connect specific parts together, especially if the manufacturer doesn’t provide any instructions or manuals with the kit. Installing an electric bike kit incorrectly could make your bike far less safe to use, especially if you’ve replaced important parts. Keeping your purchase within your skill level is the best way to keep yourself safe while you’re using your newly-converted bike. Some electric bike kits will come with extra features that you’ll never really use, but the way that most conversion kits work mean that you might have to install them anyway. This can make it harder to use your bike for day-to-day travel, mainly if you’ve had to add accessories that slow you down or stop you from controlling your bike manually. You might also end up paying an inflated price for features that you don’t want, and certain things (like speed control systems) could make up a significant part of the cost, even if you’ll leave them untouched and forget they exist. Should my conversion be permanent? Most kits won’t make a permanent change to your bike, but it can often be difficult to remove the extra parts on short notice: some will completely replace a bike’s front or back wheel, so you can’t switch back unless you still have the original wheel nearby, and others might use a special chain or pedal system that don’t function properly on a regular bike. If you aren’t confident in your ability to take apart and reassemble your bike, you should choose your kit carefully, since it might end up being semi-permanent until your skills improve. Should I try to modify the kit? A lot of e-bike kits are supposed to work with specific types of bike, but they can still be modified to support others. First-time buyers should avoid doing this unless they’re definitely sure they can pull off such a tricky modification, and instead stick to buying electric bike kits that are purpose-built for the model or style of bike they prefer to use. 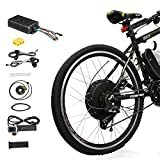 In general, this kind of project is only recommended to professionals who want to use their mechanical skills to create a completely unique electric bike.